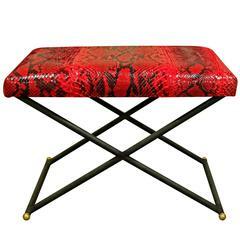 Rare X-bench in steel with brass accents and stitched python seat by Karl Springer, American, 1970s. "JMF Chair" in tessellated beige fossil stone with brass sabots by Karl Springer, American 1970s. Set of 12 JMF dining chairs covered in gray ultrasuede with upholstered seats by Karl Springer, American 1970s. These chairs are chic and very comfortable. 1970s polished brass x-bench in the style of Charles Hollis Jones. Newly upholstered in navy strike velvet. Fabric appears slightly lighter in photos.